Not all staircases are built equally. Some are grand and ornate, others are small and narrow, and yet some twist and turn as you ascend. It is for this reason there are so many stair lift options available to the consumer and why many more are still being developed. In the case of a tight, narrow staircase, many homeowners think that stair lifts simply are not an option for them. This isn’t so; there are plenty of stair lift options for narrow staircases. Here are just a few. Compact – One thing that all stair lifts designed for narrow staircases must have in common is that they must be compact. Narrow stair cases require compact lifts. Stair lifts intended for narrow stairways should be able fold up into compact little packages. Specifically, look for stair lifts that fold up against the wall. The less a stair lift sticks out from the wall, the better. The most compact stair lift on the market today stands 11 inches away from the wall. This stair lift’s foot plate, seat, and arm rests all fold up so that this model is completely out of the way when not in use. This folding up ability allows the stairway to be used by non stair lift users without it being a hindrance. Narrow – It’s not enough for a stair lift to be compactable when not being used; in order for a stair lift to work properly on a narrow staircase, it too must be narrow in design. Narrow stair lifts come in many shapes, sizes, and designs and the consumers’ choice will depend almost entirely on the shape and size of his or her staircase. Some narrow stair lifts are just that, narrow, featuring a short seat and foot platform. Homeowners who aren’t fond of this design can opt for a standing lift design. Standing lifts hug the wall very well and are great for narrow staircases. 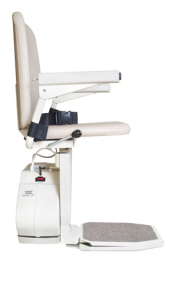 Custom – Sometimes a homeowner has a hard time finding the right stair lift for a narrow staircase. In this case many are relieved to learn that custom stair lifts are indeed a possibility. Since most stair lifts intended for narrow stairs are also designed for straight stair cases, most people who are looking for a stair lift for a curvy, narrow staircase must consider a custom design. The good news in this regard is that there is always a solution to the narrow staircase problem.